Runes are an oracle from which one seeks advice. They work best if you detail your current circumstances and then ask a specific question. Rune readings are sometimes obscure. They hint toward answers, but you have to figure out the details. This is when the rune casters intuition becomes paramount. Some times the Runes "sing" to me, and their meaning becomes instantly clear. Runic divination or "rune casting" is not "fortunetelling" in the sense that one actually sees the future. Instead, runes give one a means of analyzing the path that one is on and a likely outcome. The future is not fixed. It changes with everything one does. If one does not like the prediction, one can always change paths. The Old Germanic Runic alphabet or "Elder Futhark" contains 24 runes. The first six runes of the alphabet spell out the word "FUTHARK". As the runes spread northwards into Scandinavia, some rune symbols were dropped and the alphabet was reduced to only 16 runes. Between 400 and 600 AD, three Germanic tribes, the Angles, the Saxons and the Jutes, invaded Britain. They brought the runes with them. The forms of several of the runes changed, notably the runes for A/O, C/K, H, J, S, and Ng. Also, changes in the language led to nine runes being added to the alphabet to compensate for the extra sounds, and several runes were given different corresponding letters. This alphabet, expanded to 33 symbols, has become known as the Anglo-Saxon Futhorc. The rune names themselves have been passed down relatively intact. Although no manuscript exists listing the names of the older, Germanic runes, the Anglo-Saxon and Scandinavian rune poems agree to such an extent that their common origin can be deduced. Runes are a method of divination similar to the Tarot or the I Ching. The difference is that Runes are a set of 25 stones instead of 78 cards or a set of sticks with patterns. As with the Tarot, most of the Runes may be rightside up, or up side down, the meaning differing with the case. There are also some Runes that can not appear up side down. 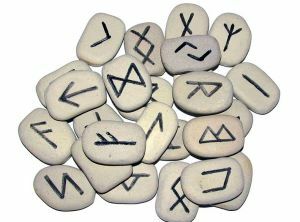 In practice, the Runes may be made of any material; ceramic, stones, sticks, or drawn on cards. Runes originated with the ancient Etruscans and were spread upwards throughout the Alpine regions to Northern Europe via the trade routes. The Germanic tribes took them and adapted them to their own needs and uses. 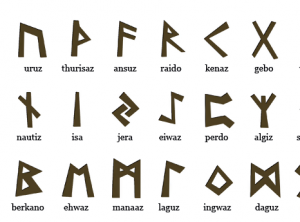 The oldest and most widespread of the Germanic runes are the Elder Futhark or Common Germanic Runes. The word rune, which occurs in various forms in Germanic and Celtic languages, means "a mystery" or "holy secret" that is "whispered". Runes were traditionally carved into bone, wood or stone which accounts for their angular shape. The lack of curves made it easier to create the shapes in either hard wood or stone.